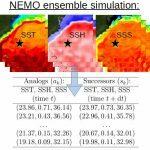 Abstract: This proposal deals with improving the modelling of large wave events during marine storms within the CMEMS service. Indeed, CMEMS operational systems only release average and peak wave parameters, with no information on individual waves whatsoever. However, developments of the state-of-the-art third-generation wave models (WAVEWATCH III and SWAN, for instance) demonstrated that, using the directional wave spectrum and theoretical statistical models for wave extremes, forecasters can accurately infer the expected shape and probability of the largest waves. The main goal of the LATEMAR project is therefore to provide the wave models used by the CMEMS service (WAM and WAVEWATCH III) with the tools to explicitly estimate the largest waves of sea states. Besides this, further targets are: to perform an extensive validation of the modeled large wave events by means of wave information retrieved from in-situ platforms; to inter-compare WAM and WAVEWATCH III model performance in the Mediterranean Sea; to investigate the sensitivity on sea state parameters of the largest waves. The CMEMS areas “marine safety” and “marine resources” will directly benefit from the proposed activity. All model developments and evaluations resulting from this R&D project will be directly applicable to the wave forecasting systems, extending the CMEMS product catalogue..